At the height of the Vietnam War protests, twenty-eight-year-old Judith Nies and her husband lived a seemingly idyllic life. Both were building their respective careers in Washington—Nies as the speechwriter and chief staffer to a core group of antiwar congressmen, her husband as a Treasury department economist. But when her husband brought home a list of questions from an FBI file with Judith's name on the front, Nies soon realized that her life was about to take a radical turn. Shocked to find herself the focus of an FBI investigation into her political activities, Nies began to reevaluate her role as grateful employee and dutiful wife. 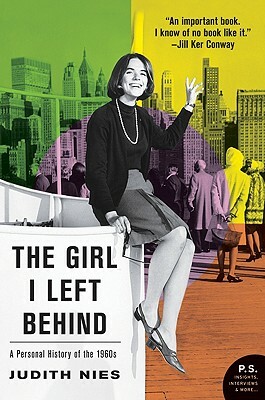 A heartfelt memoir and a piercing social commentary, The Girl I Left Behind offers a fresh, candid look at the 1960s. Recounting Nies's courageous journey toward independence and equality, it evaluates the consequences of the feminist movement on the same women who made it happen—and on the daughters born in their wake. Judith Nies has worked as a journalist, teacher, historian, researcher, and corporate speechwriter. The author of three books, including the classic biography Nine Women, she teaches a course on memoir as history and lives in Cambridge, Massachusetts.